We provide state-of-the-art IT support, services and products that allow our clients to get ahead of the competition and achieve greater success. We take the focus off your technology problems and put it back on what really matters – your business and because we recognise that smaller organisations don't necessarily have the luxury of an IT Department, we manage all of this behind the scenes for you – 24/7 – and in an efficient, friendly, reliable and cost-effective way. For a small business, outsourcing IT to The Cloud can really help drive success. Cloud-hosted services, applications and data are extremely reliable, readily available, optimised and efficient, as well as offering reduced capital expenditure. Some of the more frequent consultancy and bespoke projects that we undertake for our customers include IT security, server installations, Cloud migration and Business Continuity Planning, IT Protection and Disaster Recovery. Having the right communications tools is critical to the success of your business. With hosted telephony, all your employees can benefit from feature-rich business telephony directly from The Cloud, wherever they are, and regardless of your company size. We offer a wide range of solutions designed to develop and implement strategies that drive success. Our network health checks & other consulting services are many & varied, including application selection, security assessments and strategic planning. Connectivity is a business-critical service vital to the success of your company. We have extensive experience with different connectivity solutions and are well placed to help you select the right product to meet your business requirements. 9 out of 10 computer networks have potentially serious IT problems sitting undetected. As a leading provider of IT services, we would like to meet with your team & provide a no-obligation health assessment of your computer network and business technology. I have known Mark Miller and used his technical services for about 10 years whilst the IT manager at the Sports Centre. More recently I am now using the services of his company Apogee Solutions to provide Hardware, Software and Network Support for our servers and network. Apogee Solutions are also providing a Help Desk Service for our desktop PCs. I have found them to be a highly professional company, knowledgeable and competent in their work, and timely in their response to problems. 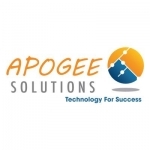 I can recommend Apogee Solutions in the provision of IT and communication services. From the initial conversation with Apogee Solutions we have found them to be efficient, courteous and responsive to our needs as well as technically competent. We would have no reservations recommending them to others!